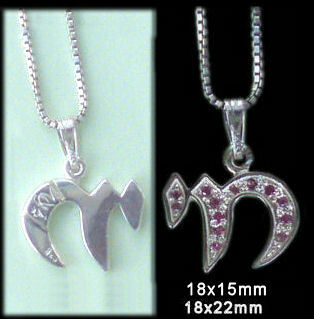 *Please view our Chai Couture Judaica Jewelry Line below (Kindly Scroll Down). If you want to return to the page that you were on previously, do not click on the link above but use your browser left arrow to bring you back to where you were before. Celebrate Life: “Be 'Chai' on Life; Wear Chai for Life," I.N. 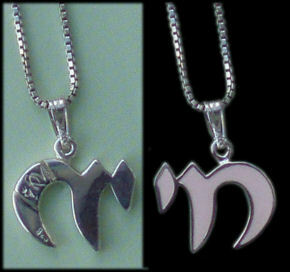 The Hebrew Letters (Chet and Yud) which spell the word “Chai”, mean Life, and total to #18. Our every original, beautiful and chic “Chai” jewelry piece is individually set and handmade, comes gift boxed with a chain (*chain included with sterling silver chai only), and a description card, explaining its uniqueness and mission. On the back, each carries our designer’s (Irene’s) engraved stamp of her signature initials (I.N.) and her trademark “Iris” flower (for Irene’s Hebrew name - see below,) proving its authenticity. 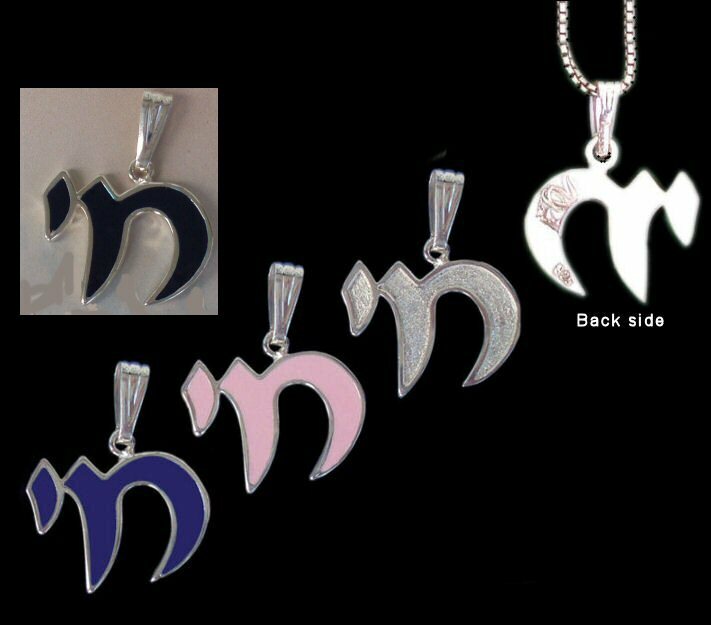 Makes a perfect gift for Bat Mitzvahs, birthdays, and all your simchas (celebrations or special occasions). **A portion of every Limited Edition retail Pink “Chai Fashion Couture and Jewelry” purchase will be donated to Breast Cancer Research Foundation. Please help find a cure; fight cancer and other life threatening diseases by choosing hope and wearing “Chai” for Life. Copyright © MazalTovPages.Com, Inc. Trademark. All Rights Reserved. *Note: Color appearance online may vary and differ slightly from actual depending on Browser. 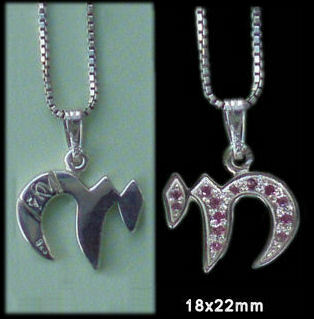 Shown in Pale Pink (top image) and Pink , Navy and Royal Blue Enamel (bottom image), as well as Plain (no enamel). Beautiful, chic, solid and high quality. Available in 18x15mm or 25x20mm (measurements not including the loop - allow approx. 7mm for loop). Our every original “Chai” jewelry piece is individually set and handmade. Comes gift boxed with chain (*chain included with sterling silver chai only). 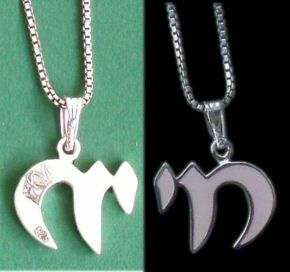 Available in any color enamel or in plain with no enamel (samples shown in images above), in Sterling Silver or 14K Gold. **Remember to specify size, metal (gold or silver) and color of enamel or CZ stones when checking out your order. *For Jewelry Special Orders: Custom Stone or Enamel Colors, Designs Styles and Metal Preferences are available upon request, please contact us for details.